For how long now have I been talking about my love of grasscloth wallpaper on my blog? I know it’s been at least three years, because I talked about using it when I first starting sharing ideas for the house, and we’ve been here three years now. I’ve wanted it for so long, and talked myself out of it for several reasons, but mostly because of the price. Grasscloth wallpaper can get expensive. But I decided to go for it, and in developing my new decorating plan, I actually considered several rooms for it. I loved the idea of putting it in the music room. I even considered the hallway. 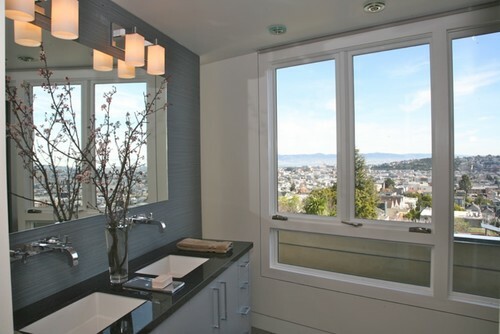 I love grasscloth in a bathroom, too. But I didn’t really want my beautiful grasscloth wallpaper relegated to the hallway, and the music room and bathroom trim are already installed and completely finished. And when it comes to grasscloth, it’s so difficult to work with that it makes the process much easier if you can install it before any trim is installed. And that made the breakfast room the perfect room for it. I foresee myself spending quite a bit of time in that room, so I’ll enjoy it more in there. 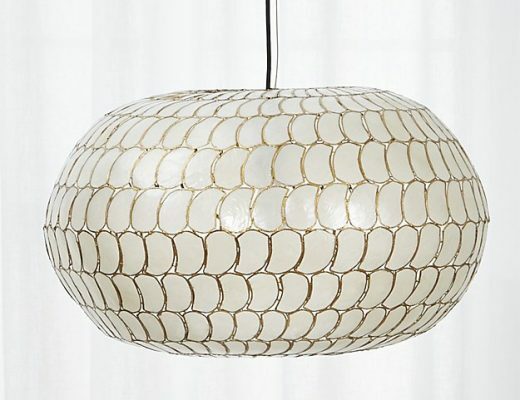 Plus, while I think grasscloth is pretty much perfect for any room, it seems even more so for a dining area. And I love how it looks with white wainscoting. So that’s the plan. 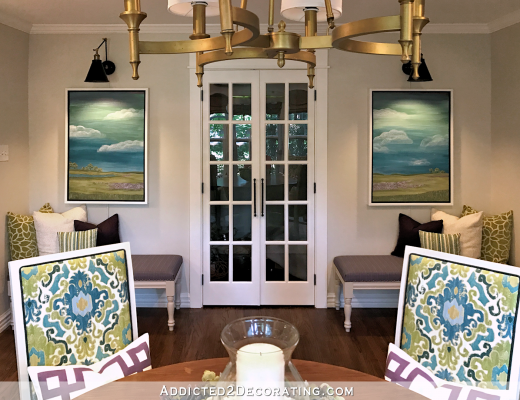 I had originally intended to find a neutral color, but after searching through all of the grasscloth wallpaper books at Sherwin Williams, I couldn’t find any neutral grasscloths that I really liked. They all seemed either too bland, or too orange, too light, too dark, too white, and on, and on. Gorgeous Muted Blue Grasscloth Wallpaper! And then I came across the most gorgeous muted blue grasscloth. I checked out the book, and then hoped and prayed on the way home that it would coordinate with the Gentleman’s Gray paint color (a dark blue) that I had chosen for my kitchen cabinets. And it did! Here’s a peek of it sitting in front of the portion of the door painted in the Gentleman’s Gray color. As I mentioned, I found it at Sherwin Williams, which is my go-to place for wallpaper. 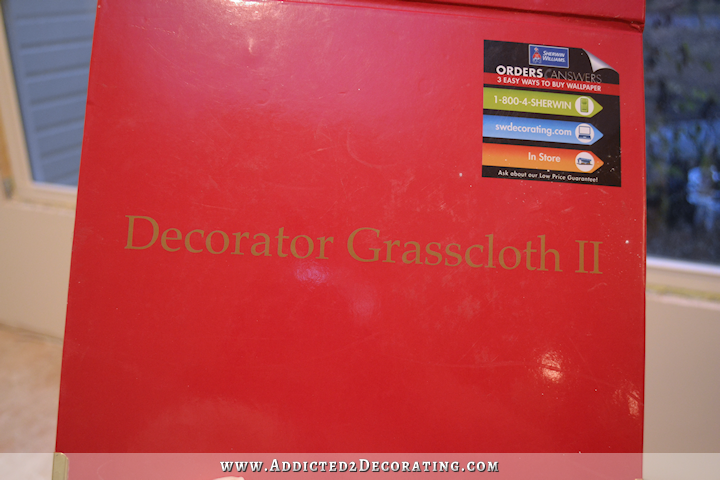 It’s in this book called Decorator Grasscloth II. And it’s paper 488-420 on page 20 of that book. So if you’ve never ordered wallpaper before, I thought I’d show you how I measure for wallpaper. Grasscloth wallpaper has no pattern repeat that has to be matched up from piece to piece, so it’s much easier to figure how much I need with it as opposed to a floral pattern or something like that. 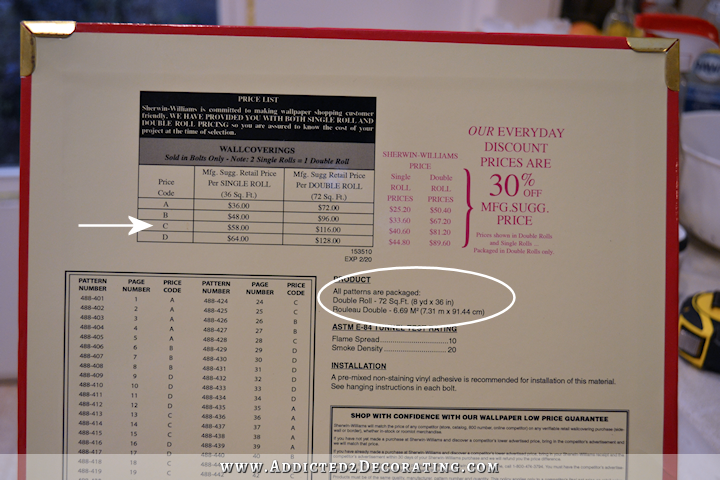 Just an FYI, to find the price of wallpaper, you just look for the price code on the back of the paper you like. This is a price code C. Then you flip to the price chart either in the front or back of the book, and see how much the paper is. I don’t know why they even bother giving prices for single rolls, because 99.999% of the time, wallpaper is sold in double rolls. And then somewhere close to that chart you’ll find the measurements of a double roll. This grasscloth double roll measures 36″ wide by 8 yards (24 feet). If you’re using a wallpaper with a pattern on it, the measurements might be listed on the back of that particular wallpaper sample. First, I determined my starting point for installation. I decided to start in the right corner of this wall because that lip at the top of the front wall would make wrapping wallpaper around the corner impossible. So I’ll start in the right corner and work my way counterclockwise around the room. 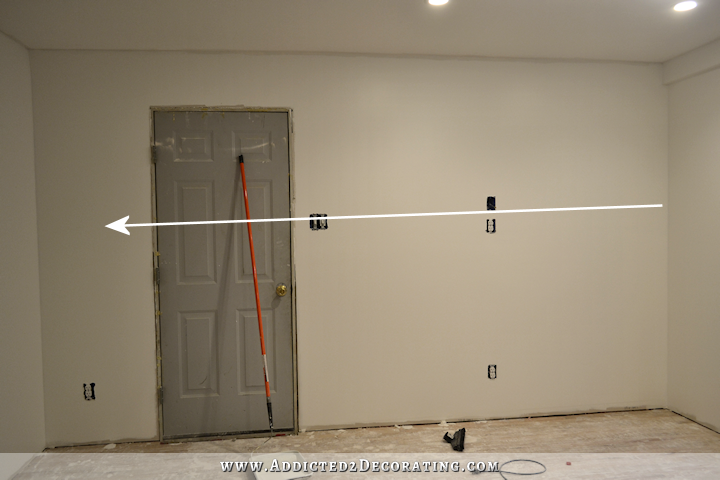 I mark my line for the chair rail, and then measure the wall and determine how many widths of wallpaper will be needed. 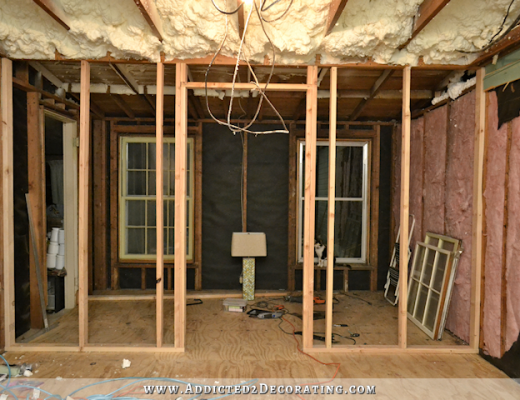 This wall is 163 inches wide, so it will require just over 4.5 widths of the 36-inch-wide wallpaper. You can see that I’ll waste quite a chunk of wallpaper in the door area, but that can’t be avoided since the door is only 32 inches wide, and the wallpaper is 36 inches wide. So no matter how I positioned the wallpaper on this wall, I would still need full lengths around the door. Then continuing around to the next wall, that will start with the half piece that wraps around from the first wall, and then will require 3.8 additional widths. Moving to the next wall, I continued marking out my 36-inch widths. You can see that on this wall, three of the widths will be very short since they are completely above the opening. And then on the final wall, it starts with a piece that will wrap from the previous wall, then a full piece, two short pieces (nothing needed under the window because of the chair rail), and finally one full piece. 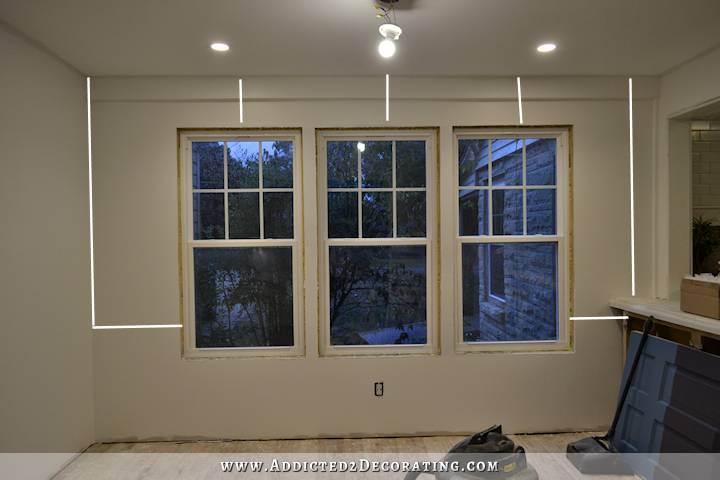 Nothing is needed between the windows because those areas will be completely covered with window trim. After all of that measuring and marking, I then go back and count how may FULL lengths of wallpaper will be needed. For this room, since I’ll be using a chair rail and wainscoting on the bottom of the wall, a full length is only 63 inches long. So according to my diagrammed pictures, I’ll need 13 full lengths of wallpaper at 63 inches long. That’s 819 inches. In addition, I’ll also need 5 pieces that are 11 inches long to go over openings and windows. That’s an additional 55 inches. In total, I’ll need 875 inches of wallpaper for this room. That’s 24.28 yards, and each double roll comes with 8 yards. So in order to cover my walls, plus have a bit extra for mess ups (I always like to allow for a minimum of two full extra lengths for mess ups), I’ll need four double rolls of wallpaper. Okay, now just for fun, let’s pretend that I’m using a patterned wallpaper, and I need to figure how many rolls I need. That process is similar but different. Let’s say for this example that I’m using a paper with a 24-inch vertical pattern repeat. I’d still diagram my walls just as I did above. I’d still figure out how many widths of wallpaper I need to go around the room. But how do you figure for matching pattern repeats? It’s simple. Again, because of the wainscoting, the full wallpaper length required for my walls is 63 inches. But if my wallpaper has a vertical pattern repeat of 24 inches, then I actually have to figure how many repeats will be needed for each width of wallpaper in order to match the pattern on the next piece. 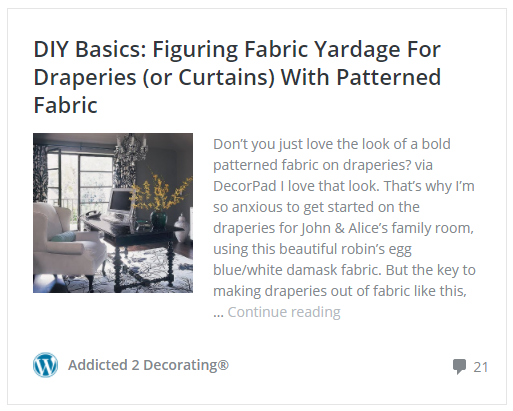 If you just cut the wallpaper at the chair rail, and then start the next piece of wallpaper where you cut it (which is exactly what you can do with grasscloth and other textural wallpapers with no vertical pattern repeats), you’d end up with a mess where none of your patterns meet on the seams. So in order for your patterns to meet, you have to figure repeats per length rather than inches per length. 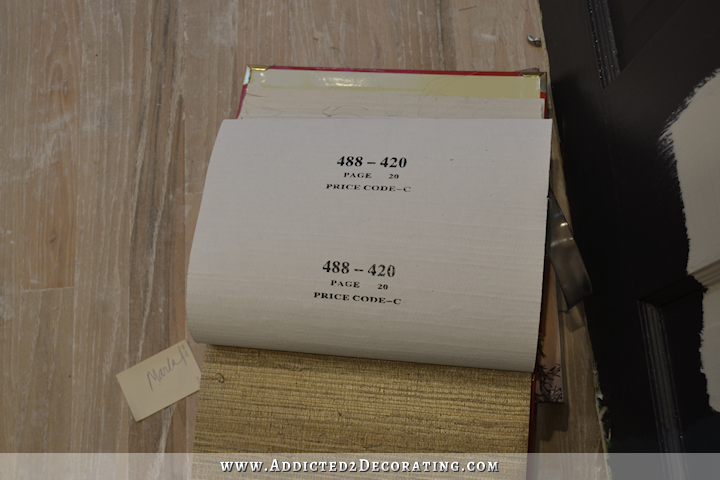 In order to do that, you take the length you need (63 inches) and divide by the vertical repeat (24 inches) to come up with the number of repeats you have to allow for each length of wallpaper. In this case, it would be 2.625 repeats, which you would round up to three. So for each full length of wallpaper, I would have to figure three repeats, or 72 inches of wallpaper. For my room, with 13 full lengths needed, that would require 936 inches. The additional five short lengths would each require a one vertical repeat allowance, for an additional 120 inches. So my room, using a patterned wallpaper that’s 36 inches wide with a 24-inch vertical repeat, would require 1,056 inches of wallpaper, or 29.33 yards. And again, I’d allow for an additional two full lengths just in case I cut something wrong, tear the wallpaper, or mess it up in some other way. Anyway, I hope that helps. Figuring fabric repeats when making draperies where you need to match fabric is done the same way. I wrote about that here. Awesome and useful info! I hope you will be able to hang it so the seams aren’t so visible like they are in the second pic. Glad you decided on using it. 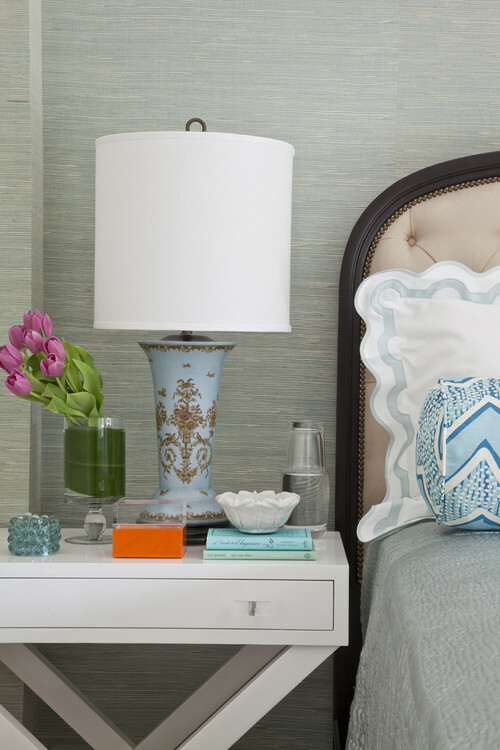 No doubt this will become your most frequented room! Very useful info! I hope you will be able to hang it so the seams aren’t so visible like they are in the second pic. Glad you decided on using it. No doubt this will become your most frequented room! Whoops. Meant the third pic..the dining room. Sorry for the duplicate post, too. Grass cloth, of course! I love what you chose and think it will go well with your new cabinet colors. Very nice and I am excited to see it complete! You may have just solved my bedroom decorating problem. Thanks. Ps love that you are just following your instincts. Love your choice! It’s going to be gorgeous, and the good thing is that I know you will love it. That down time really helped you to focus on what YOU like. Goes to show that one should never be too hasty when it comes to decor. You have to ponder it for a bit to make sure it’s what you want, and not what you THINK you want. I had a friend who was so scared to decorate that she did nothing. I once told her to choose colors that she gravitated to in her mind, and not what she thought others would think. She listened, and found that she liked colors she had in her garden – her “happy place – and used them inside. Her home is now a reflection of her, and you feel welcomed when you walk in, because it’s like she’s hugging you. It’s warm, cheery and not at all like everyone else, and neither is she! I wish you luck hanging the grasscloth, it’s not that fun, but at least you don’t have to go floor to ceiling! For that, you might need a helper to hold the ends! Been there! I’m so happy you get to use the grasscloth wallpaper in your breakfast room. I know it is expensive, but I also know how much you’ve always loved it. I love the color you’ve chosen and how it looks with the Gentlemans Gray paint color. This room is going to look A-MAZ-ING and I’m so excited to see the pretty stuff come together! Kristi’s got her groove back! I love it! I can tell (hear) your excitement that YOUR vision is coming to fruition! I can hardly wait to see it! 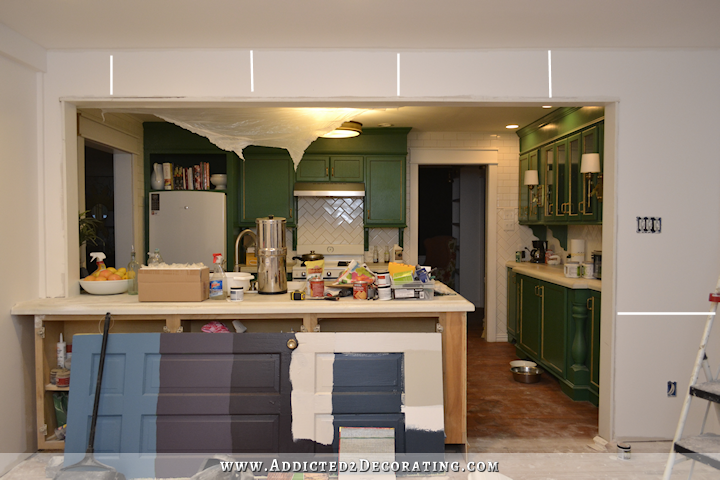 Just curious as to what you will do next– painting kitchen cabinets or working on the breakfast room. I can see you enjoying this new space! I was just wondering that myself. 🙂 I’ll be ordering the wallpaper today, so in the meantime, I have to keep busy with something. My back still isn’t quite ready for any heavy lifting projects like building cabinets for the pantry, so I might do something relatively easy. Painting kitchen cabinets would probably fit the bill. Is this the room you were going to paint black? 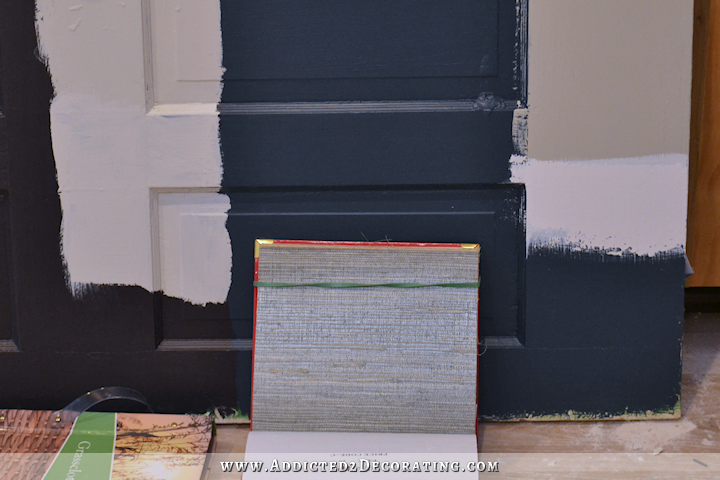 Have you considered doing a grass cloth faux paint? We just did that in our bedroom and I absolutely love it! 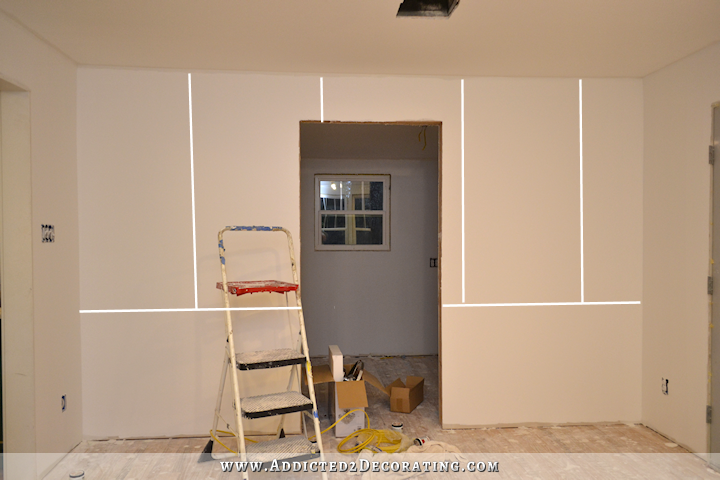 We did three walls in a light color, the third wall in a darker color in the same group. 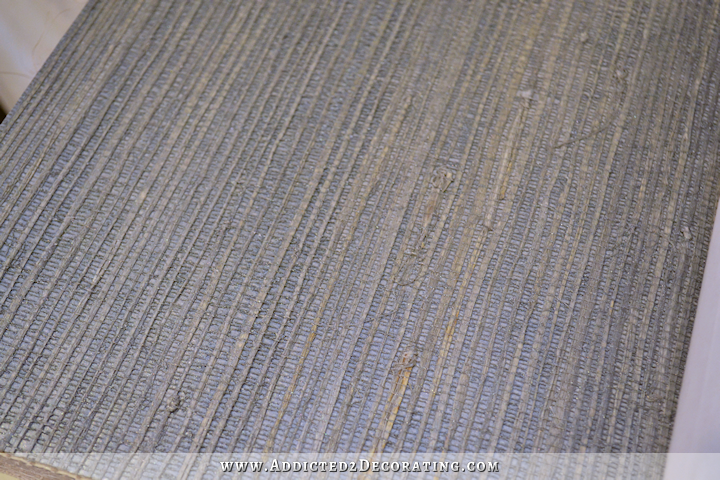 We then used the lighter color for the striated paint effect on the dark wall. We did side to side to avoid the ‘line’ from going up and down. Haven’t you tried something like this before as a sample? Only up and down? I really, really like the side to side effect. It would certainly be a lot less expensive. 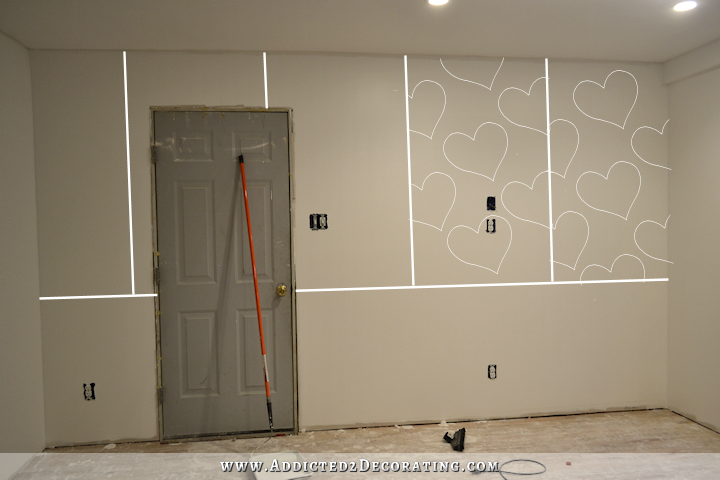 No matter how you do it; wall paper or paint, it will be gorgeous. Oh, I’d love to see it! Messy rooms don’t offend me. 🙂 You can email it to me. Pretty please. That wallpaper is just sooo pretty. I have always liked grasscloth too. It’s truly a classic as it’s been around a long time. More than over 25 years it was installed in an office I had at the time. It was professionally installed and the seams were visible- that is the nature of the product. I can’t wait to see your new colors come together. As much as I liked the green cabinets, I think the blue will be gorgeous. Your blog is so fun to follow! I’ll be using a white concrete stain to see if I can brighten them up. I might even try to do some faux “veins” with some various gray stains to see if I can get a marble look. But the black countertops are out now since I’m going with much darker lower cabinets. Perfect! Can’t wait to see it up! Love the grass cloth! My brother has been hanging wallpaper for over 35 years for designers in Dallas. He says they are now asking that grasscloth be hung horizonally! It takes at least two people to hang it, but looks really great. I am so happy that you have not lost your train of thought and are still working on this room. It is so fulfilling to see this house decorated one room at a time. If you walk away from this room, I will feel like I was watching a movie without an ending. I was definitely hoping you’d find a blue grasscloth to work with. I actually couldn’t decide if you should go blue or green but I definitely thought it would do well as part of a whole house plan. I think you’re definitely starting down the right path for this! Love love love love LOVE the paper and the paint colour! I love the one you chose, the blue is very pretty and has a pleasantly calming effect (my parents’ was a natural colour leaning towards a light green which made the hallway look a bit sickly). because of you I’ve kind of just come round to consider it something you can actually choose to make rooms nice instead of it being that weird design choice of my parents back in the 70ies 🙂 I haven’t yet seen it painted over so don’t know if I’m now going to miss it… I’m really looking forward to seeing both your rooms with the blue colours – I’m sure it willl look stunning! Va Va Voom! I am thinking of using it in my entry hall! Plus my entry hall has a lot of openings and is the smallest room in the house; budget!!! Are you going to hang it yourself or have it done by a tradesman? I would hire someone as my walls are textured and would need a liner paper underneath. Thanks for the tips. I love your choice. It’s stunning! I have always liked the texture of grasscloth but didn’t ever see a colour I liked. I’m going to re-visit this! I really like your grasscloth choice! I hung it once in the 80s and said”never again” but I loved the results. This room will be beautiful and timeless! This will be so beautiful! I love the color with the blue you’ve chosen for the kitchen. I am not sure I’d be brave enough to use grasscloth in a bathroom or eating area–I would be so anxious about stains and water spots. Is grasscloth as delicate as it looks? I definitely wouldn’t describe it as delicate, but it’s not something you can scrub if it gets dirty, either. It is porous, so if something wet gets on it, it will definitely soak in. Good plan. Had it hung in our entry when we moved in 6 yrs ago and still love it. Ours has a black background with neutral grass. Have painted over it in a couple of prior homes and loved that look too. It’s versatile and timeless. Great color also. This is probably a dumb question since i don’t know much about decorating or wallpaper, but since there is no UP or DOWN pattern on this why don’t you hang the paper horizontally around the room? You would have so few seams to match this way, a few thumb tacks would hold things in place while they drive and it seems like it would use less paper? Hi kristi, I really loved your choice. It is looking very pretty and stunning at the wall, I like blue color the most. This is best idea to decorate rooms. Thanks for sharing this article. I know how to wallpaper and measure for it, but it was fun seeing how you did it. That is a lot of money for wallpaper. I hope we don’t end up hearing “well I can use it in the office or in the bedroom” because you have changed your mind once again. I love the color of the grass cloth and it certainly will not conflict with your new kitchen colors. I hope you are going to change out your knob and fixtures in your kitchen to something more brushed chrome or stainless. If you can’t afford to do that, I would sugest taking them outside and spray painting them with one of the great metal sprays that are on the market. If you swap out your appliances for stainless steel, I would like to make a suggestion about your fridge. You should get one that is counter depth and a full fridge. You are going to have a freezer in the pantry, so there is no need for one in the kitchen. Also get one that is tall enough to eliminate that space above the fridge, or purchase a stainless steel vent the size of the fridge to fit in that space. It will give the fridge added ventilation and look as though it was built in like the high end ones. I would also check with the DW mfg to see if they have panels for the front of yours. That would save you replacing it. Can’t remember, but I think you have gas, and you should try to get one with more than four burners and an electric oven. Trying to buy a stove with only four burners now, will probably cost more than the more popular ones. I think this will be your forever kitchen and it will really look great. I know the green was your love for a while, but it really was not practical with the gold etc. Use your cabinet building skills on your built in’s in the breakfast room and pantry. And remember keep it simple, too much of a good thing is too much. Love the direction you are going in! Seriously? I’ve never read a comment post with this many directions/recommendations/and you “should” instructions. I came across this website because I was researching how to paint my kitchen cabinets. I appreciate the simplicity and ease of instructions on what she chooses to explain. People that get so caught up in this blogger’s life is kind of scary. Thank you Kristi for providing the information and tutorials that you do. Alternatively, I respect your patience when the need arises. One post I’m still laughing about are the “death shades” you made a while back. Good luck with the continuing renovations.